For over 65 years, St. Ann School has been serving the Parish of St. Ann and the communities of Emmaus, Macungie and surrounding areas by providing a quality Catholic education to students. Under the leadership and guidance of the principal, and pastor our experienced and dedicated faculty and staff recognize the dignity and differences of each child. They provide our students with a quality education in which the students have the opportunity to develop spiritually, academically, physically, and morally within a community of faith that inspires them to become life-long learners, faith-filled citizens and live as Jesus lived. Recognizing that parents are the primary educators of their children, here at St. Ann's we encourage parents to take an active role in their child's education, school life and spiritual growth. We encourage our parents to become active in our Home & School Association and become involved in the activities that help add to the success of our school. Parents are also encouraged to take advantage of the many opportunities to volunteer, in the classroom, cafeteria, at Home & School events, on field trips and in many other areas of the school community. The St. Ann School curriculum meets all educational guidelines established by the Diocese of Allentown. In addition the curriculum meets and exceeds Pennsylvania State Standards and we are proud of our accreditation by the Middle States Association of Colleges and Schools. St. Ann School maintains high standards for our students, faculty, and staff. We are proud of our students’ achievements and accomplishments as evidenced by our challenging curriculum, high standardized test scores and recognitions our students have received at the Diocesan level as well as within the community for the many contests and competitions in which they have participated. Our students are well prepared for High School and 96% of our Catholic High School Graduates have gone on to college. Our St Ann graduates have continued their education at colleges such as, Duke University, John Hopkins University, Carnegie Mellon University, Lehigh University, Seton Hall University, Villanova University, Penn State University, Susquehanna University, Duesquene University, West Chester University. Kings College, and East Stroudsburg University. Our spirit of service is demonstrated in the many ways we reach out to our parish, our community, and our nation. Through our school prayer partners, our participation in community events, our organization of clothing drives, toy collections, and food drives, along with our monetary donations to local and national charitable organizations, our service to others is evident in everything we do. Spirituality, Academics, Service all make your choice of St. Ann School an excellent investment in your child's future. Thank you for taking the time to explore the various opportunities St. Ann School has to offer. 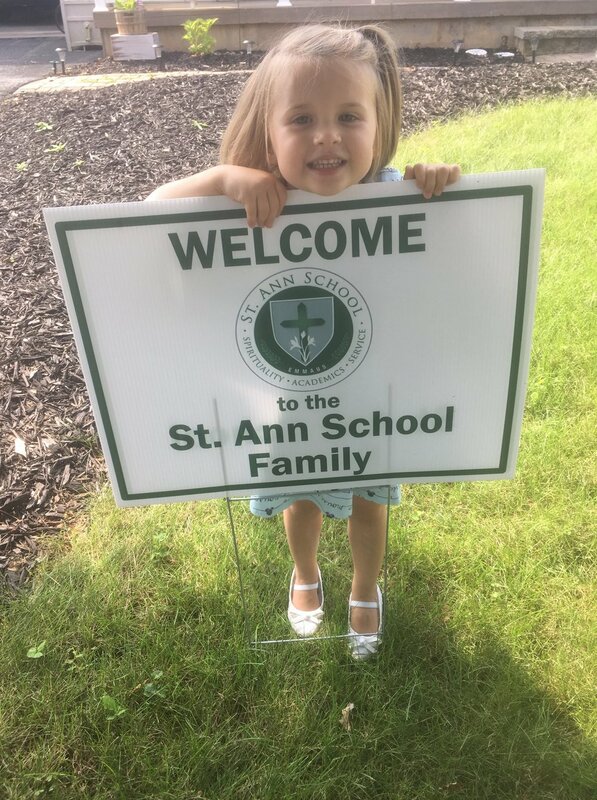 When choosing a Catholic School for your child, we hope you will prayerfully consider St. Ann's. If you would like to schedule a tour or have your child visit, please call the school office at 610-965-9220.